The bank robber at Compass Bank in St. Johns County. 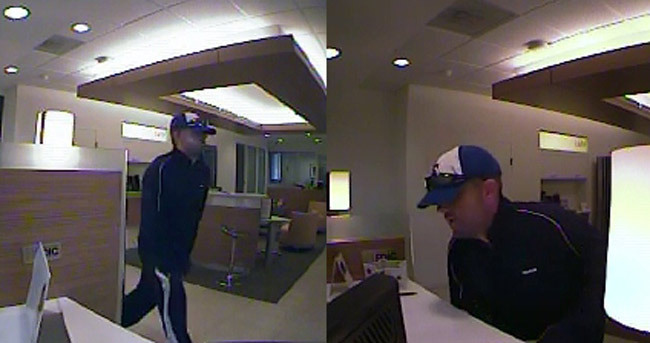 A man who bears a striking resemblance in look and demeanor to the man who attempted to rob Hancock Bank in Palm Coast last week, and actually robbed a Sun Trust bank branch in Ormond Beach half an hour later, is being sought in connection with a bank robbery Tuesday afternoon at Compass Bank on a U.S. 1 in St. Johns County. The suspect entered the bank around 2:37 p.m., approached the teller and demanded money—in much the same way that the suspect had in Palm Coast and Ormond Beach last week. An undisclosed amount of cash was turned over to the suspect, who then fled the bank. He was last seen traveling southbound on U.S. 1 in a grey or silver colored sedan. Last week, Ormond Beach police believed the Sun Trust robber had gotten away in a silver vehicle. In none of the incidents was the suspect armed. The suspect in St. Johns County was described as a white male in his mid to late 20’s wearing dark colored clothing with light colored stripes on the side of the jacket and pants. He was also wearing a blue and white ball cap with an “F,” and had sunglasses on his hat. (The suspect last week wore a loose tie and white shirt, and pants. He also wore a Jacksonville Jaguars cap. Anyone with any information concerning the identity of the suspect is asked to contact detectives with the St. Johns County Sheriff’s Office Robbery/Homicide Unit at (904) 824-8304. You can remain anonymous and possibly be eligible for a cash reward by calling CrimeStoppers of N.E. Florida at 1-(888) 277-TIPS(8477).